Today we wish a happy birthday to Anthony Daniels who turns 69 today! We look forward to seeing him as C-3PO this December as he returns to the big screen. Here is this week’s Around the Web news roundup of Star Wars and beyond. Lots of cool stuff this week from the return of Darth Revan, new Episode VII pics and rumors, plus some cool movie trailers. You can listen to an audio excerpt from James Luceno‘s upcoming book Tarkin over on Random House’s product page. Just click on the audiobook tab. Jedi News spotted a cool piece of news regarding New York Comic Con. Marvel will be revealing a scoop on new Star Wars comics at the Marvel: Axel-in Charge panel. Bewitched Fan Fare 2014 is September 17 through 20 in Los Angeles, CA. Star Wars guests include David Ankrum, Felix Silla. GrandCon Gaming & Comics Convention is September 19 through 21 in Grand Rapids, MI. Star Wars guests include Jeff Dee, Dave Dorman, Jeff Grubb, Mark McKenna. Fiction Meets Reality is September 19 through 21 in Speyer, Germany at teh Technik Musuem Speyer. Star Wars guests include Jeremy Bulloch, Daniel Logan. Kentucky Star Wars Collectors Club Fall Festival is September 20 in Lexington, KY at Faith Lutheran Church, 1000 Tates Creek Rd. from Noon to 6:00 PM. Rose City Comic Con is September 20 through 21 in Portland, OR. Star Wars guests include Cam Clarke. RocCon is September 19 to 21 in Rochester, NY. Star Wars guests include Bonnie Piesse, Jeremy Barlow, Corrina Bechko, and Gabriel Hardman. Autographica is September 19 through 21st in Birmingham, England. Star Wars guests include Kenny Baker, Jeremy Bulloch, Rusty Goffe, David Prowse. Cincinnati Comic Expo is September 19 to 21 in Cincinnati, OH. Star Wars guests include Peter Mayhew, Tim Rose, John Morton, Dickey Beer, Daniel Logan, David Michael Beck, Joe Corroney, Mark McHaley. Vampire Ball is September 26 to 27 in Birmingham, England. Star Wars guests include James Marsters. Courts Celebrities FanFest is September 26 through 27 in Burbank, CA. Star Wars guests include Kathleen Gati. Alamo City Comic Con is September 26 through 28 in San Antonio, TX. Star Wars guests include Tom Kane, Hal Rayle, George Takei. The Pittsburgh Comicon is September 26 to 28 in Monroeville, PA. Star Wars guests include Orli Shoshan, Christian J. Simpson. Stoke Con Trent is September 28 in Stoke-On-Trent, England. Star Wars guests include Paul Blake, Chris Bunn, Laurie Goode, Garrick Hagon, Alan Harris, Barrie Holland, Derek Lyons, Cathy Munroe, Chris Parsons, Toby Philpott, Marc Silk. Star Wars Day is October 4 at Discovery World in Milwaukee, WI. Star Wars guests include Dave Dorman. For more events, be sure to check out Star Wars Actors Appearances. You can also find more of Timothy Zahn’s 2014 appearances on his Facebook page. To kick things off, how about some reassuring news regarding Dark Horse Comics and Star Wars. According to Bleeding Cool, Star Wars will be with Dark Horse Comics for the entirety of 2014. They will continue to make Darth Vader miniseries, Star Wars Legacy will remain an ongoing book and will alternate between artists every six issues and the mini-series based on George Lucas’ original drafts, The Star Wars, will have a radically different logo to differentiate it. It’s been officially announced that Anthony Daniels will be heading to Star Wars Celebration Europe II. Today we wish a happy birthday to actor Anthony Daniels, our favorite protocol droid. Be sure to stop by Twitter and wish him a happy birthday! StarWars.com announced that Anthony Daniels will be heading to Star Wars Celebration VI. You can see the official announcement here. 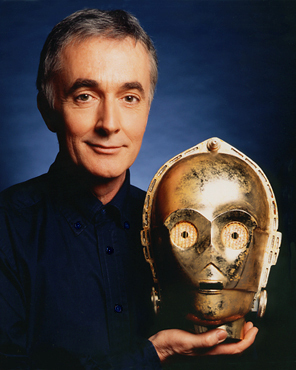 Today we wish a very happy birthday to actor Anthony Daniels. Famous for his portrayal of C-3PO, Daniels has played the character in all six Star Wars films and in various side projects. He also does the voice for C-3PO in The Clone Wars and is rumored to be set to play a part in the upcoming live action series. If you’d like to find out more about him, you can check out his official site or on Twitter. WOW! George Lucas has sent a Jedi-Temple-a-like containing 6 beautiful volumes of the Eps in a stunning wooden case. Has yours arrived yet? Honestly we don’t know if this set exists or if Mr. Daniels is having a little fun with those of us trolling the twitterverse, starving for any scrap he might cast our way. We do hope it is the former. We’ll keep our eyes peeled to see if this set does become available though, you can count on that! "I would like to thank the academy..."